Address: Bernegal, s/n, Puerto del Carmen (Lanzarote), Islas Canarias. 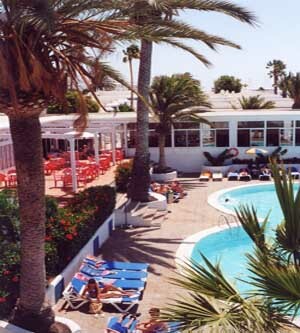 Apartamentos Jables Bermudas is situated in the tourist centre of Puerto del Carmen, on the south coast of Lanzarote. Facilities include outdoor swimming pools for adults and children. All apartments at Jables Bermudas include satellite TV, tea and coffee facilities, a microwave and toaster. All also feature a balcony or terrace, a hairdryer and a safe. Mini golf, a gym and paddle tennis are available at the Jable Bermudas complex. Guests can also make use of the supermarket. Wi-Fi is available for a surcharge. Puerto del Carmen Beach lies just 100 metres from the complex. The fantastic beaches of El Papagayo are a short drive away and there is free public parking on site. This property will not accommodate hen, stag or similar parties. The swimming pool bar is closed from Mon 19 Nov 2018 until Mon 03 Dec 2018, our clients can use during those days the pool bar and the pool of our neighboring Hotel Apartamentos Los Hibiscos. American Express is not accepted as a method of payment. Please note the name of the credit card holder must match the name on the reservation confirmation. The safe available in all rooms carries a surcharge.